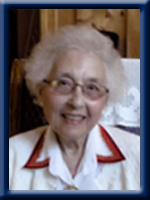 FORBES – Myrtle Blanche, 93, of Milton, Queens County, passed away Friday, July 30th, 2010 in Passamaquoddy Lodge, St. Andrews, NB. Born in Vogler’s Cove, she was a daughter of the late Murray and Freda (Vogler) Nowe. Myrtle’s great joy was going to her cottage on Cameron Lake. Until her early seventies, she was an avid canoer and enjoyed many canoe trips with her late husband John Archibald Forbes. Myrtle also enjoyed picnicking and walks on Summerville Beach. She loved to play cards, read, knit and crochet. Myrtle was a long standing member of the Arbutus Chapter, # 30, Order of the Eastern Star, Milton. Myrtle is survived by her daughters: Paula Cooper-Bertke of St. Andrews, NB; Yvonne Ellis of Halifax, NS. and Cheryl Forbes of Ireland. Grandchildren: Debra Kerwin of Ottawa, ON. ; Andrew Cooper, St. Andrews, NB. ; Jennifer Ellis, Digby, NS. ; Amy McAllister, Halifax, NS. Great grandchildren: Jillian and Jennifer Kerwin; Emilia and Paulina Cooper. Predeceased besides her parents and husband are her sister Pauline Conrad and her brother Owen. I am very sorry to hear about the loss of your Mom. I was very fortunate to have met your Mom through my work at Home Support. I really enjoyed spending time with Myrtle. Myrtle talked alot about her daughters and grandchildren, she was very proud of you all. She was a very strong woman who had a very kind heart. I will miss her very much. She is at peace now . So sorry to hear of your Mom’s passing. I know that you will miss her and she lived a good long life. Please accept my condolences and my prayers and thought are with you and the whole family during these difficult days. Sorry to hear about the loss myrtle I used to love to talk to her after I got done mowing her lawn .she always made me smile.I will miss her great sense of humor and smile. I am sorry to hear about the loss of your Mother. My thoughts are with you at this sad time. So sorry to hear of your mom’s passing. Betty and I wish we would have visited over the years to talk of family, etc. Thinking of you during this difficult time. We send you our deepest sympathies. KNow we haven’t been in touch but see you are in Ireland – if you get the time, maybe send us an update…. ps Noreen (the scank) retired LAST June. So sorry for your loss. You’re in my thoughts. In Ireland? When you’re feeling up to it, drop a line. I know it will take time to come to grips with it all, and feel she is still in your life every day in a special way. Nor. in the way you see the world. I hope the sadness of this time is quickly replaced with those comforting memories in your heart. Plan to see you soon. Please accept my deepest sympathy on the recent loss of your families loved one. My apologies, this should have read to Myrtle Forbes’s family.